In a famous and enduringly influential reading of Jane Austen’s novels, the moral philospher Alasdair MacIntyre argues in his germinal work of moral philosophy After Virtue (1981) that Austen was the ‘last, great effective voice of that tradition of thought about, and practice of, the virtues’. MacIntyre suggests that Austen’s novels promote a catalogue of virtuous behaviours including amiability, practical intelligence, constancy, humility, and a capacity for self-examination. 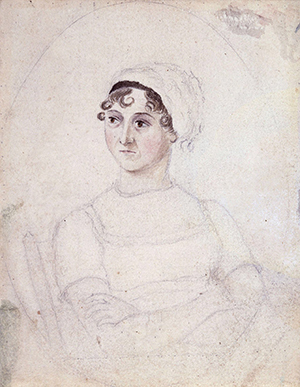 These intrinsic virtues, practised by Austen’s heroines and heroes, can be considered to build character in a manner that can be distinguished from the simulated charms of personages in her novels who are focused on external goods such as wealth and reputation. It is essential to MacIntyre’s conception of the virtues that they are not timeless and universal, but relevant to particular societies in their struggle against the vices and social ills of their age. Perhaps controversially MacIntyre insists that for Austen the ‘touchstone of the virtues is a certain kind of marriage and indeed a certain kind of [English] naval officer’. For Austen companionate marriage is conceived in patriotic and conservative terms as supporting a well ordered household and stable social structures. Austen’s emphasis on constancy as a cardinal virtue is buttressed, argues MacIntyre, by her powerful moral criticism of irresponsible parents, and guardians, and the caprice of younger romantics such as Marianne Dashwood. This lecture explored the strengths and weaknesses of MacInytre’s interpretation of Austen’s novels and its subsequent critical reception. It emphasized that MacIntrye is contributing to an ongoing repositioning of Austen as a novelist with moral and philosophical intentions. Dr Curthoys examined MacIntyre’s interpretation of Austen alongside recent scholarship pointing to her reinvention of literary genres focused on manners and social etiquette and her promotion, following David Hume, of the ‘education of the passions’. Lastly the lecture discussed Austen’s indebtedness to the Third Earl of Shaftesbury’s discourse on the profound moral significance of robust and convivial conversation. Dr Ned Curthoys is a senior lecturer in English and Cultural Studies at The University of Western Australia. He has published on various dimensions of moral philosophy and virtue ethics, principally in his monograph The Legacy of Liberal Judaism: Ernst Cassirer and Hannah Arendt’s Hidden Conversation (2013).